Mitchell Starc and Usman Khawaja have responded to their critics with a five-wicket haul and century respectively against Sri Lanka on day three in Canberra. Mitchell Starc and Usman Khawaja answered their critics and surely put to doubt any questions over their Ashes selection on a dominant day three of the second Test against Sri Lanka in Canberra. Australia's two under-fire players starred on Sunday, as Starc claimed 5-54 to help roll Sri Lanka for 215 before Usman Khawaja's unbeaten 101 helped the hosts to 3(dec)-196 and allowed captain Tim Paine to set an unlikely target of 516. Sri Lanka were 0-17 in reply when bad light ended play on day three. In his last Test innings before the Ashes and after a home summer without a century, Khawaja combined with Travis Head (59no) for a 159-run fourth-wicket stand after the hosts had earlier fallen to 3-37. Joe Burns (9) nicked Kasun Rajitha and Marcus Harris (14) and Marnus Labuschagne (4) edged off the bowling of Vishwa Fernando, before Khawaja finally looked back to near his best for most of his typically stylish knock. Watchful for his first 30 runs, Khawaja hit his last 71 off 73 balls as Australia upped the ante and the left-hander was dangerous all around the ground and particularly on the cover drive. "Cricket has been frustrating, the Indian series, especially losing 2-1," Khawaja said. "And that's the hardest thing, getting lots of starts and not going on with them. It was nice to get a start today and go on with it." It came after a dramatic morning at Manuka Oval where Kusal Perera was twice struck by Jhye Richardson on the helmet and became the second Sri Lankan to retire hurt in the innings. Play was stopped for several minutes while his broken helmet was replaced after the second blow. He was assessed again at the end of the over by Sri Lankan medical staff and left the field three balls later on 29 and didn't return. His replacement Dimuth Karunaratne had only been released from hospital on Saturday night after a blow to the neck from Pat Cummins, with both injuries having halted Sri Lanka's momentum. Fresh from picking up the dangerous Dinesh Chandimal late on day two, Starc unleashed a spell of fast pace bowling that was full of bounce. He had Dhananjaya de Silva hit wicket for 25 from a short ball he attempted to pull, and then removed Karunaratne for 59 when he had him edging to Kurtis Patterson at gully on the drive. Dilruwan Perera (10) and Fernando were his last victims as he bagged his 10th career five-wicket haul and fifth against Sri Lanka. 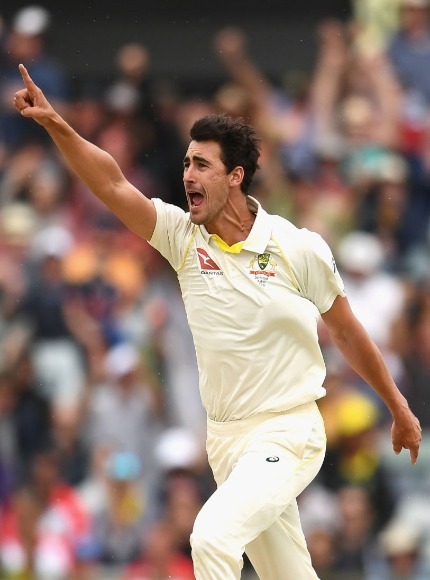 "The one for me this week was just to run in and bowl fast," Starc said. "Wickets are a wonderful thing. They help everything as well. I found a bit of swing there today as well."